Above is a photo of my cat Shyna again. Yes, Shyna`s photo library on my blog is still not big enough. I need to work on this. I am kidding. But you know, I like her so much that she’s not just a part of my life but also a part of my personal blog. Back then I often published photos of her in colour and I still do, but somehow I also like these photos in black and white. It totally works. 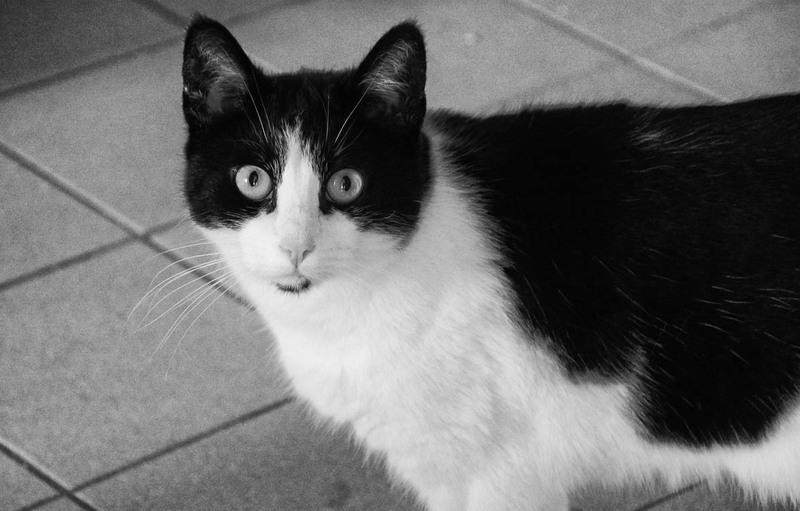 Yes, a black and white tuxedo cat gives you the option of b&w photos that (I agree) are more satisfying than color ones! My Persian kitty boys are smoke Persians, which means they are black cats with lovely silver highlights in their fur that are more noticeable the older they get. I’ve often been happier with b&w photos of them because the highlights show up better and aren’t “polluted” (yellowish) by artifical light. Give the beautiful Shyna a nice head rub for me! Such a beautiful kitty! You described it perfectly. Shyna also often has a yellowish white, especially during autumn and winter when I use artificial lights. Generally, the images have a reddish or orange tone during that time as well. So, I do agree… it depends on the lightning, if I am happy with that and the color, I will publish it normal… if the photo is good but colors and lightning not, then I always go black and white. It also gives it more texture or clarity. I am a big fan of black and white images. It’s so basic, but yet so beautiful. I agree on the qualities of black and white images. In the old film days, different black and white films produced different effects, and that was fun to experiment with.